Officials expect the Intelsat 19 communications satellite will suffer permanent performance degradation from a damaged solar array which finally popped loose in June after early attempts to deploy the panel failed. The satellite's south solar array stayed folded against the spacecraft following its deployment from a Sea Launch Zenit 3SL rocket June 1. The north solar array unfurled as planned. Intelsat confirmed the solar panel unfurled June 12, and engineers began activating the satellite's communications payload to determine how much of the craft's original mission could be accomplished. All of Intelsat 19's communications antennas have deployed, officials said. The communications firm announced last week that data received from Intelsat 19 indicate the south solar array is damaged, and the power available to the satellite will be reduced. 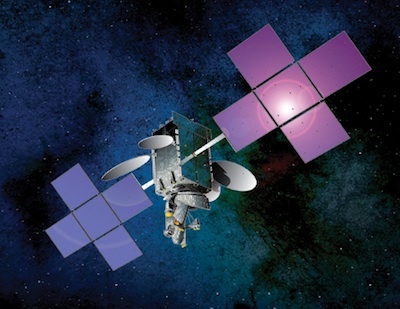 Intelsat said sufficient power is available to operate Intelsat 19's Ku-band and C-band payloads. The satellite carries 34 Ku-band and 24 C-band transponders. Officials expect the Intelsat 8 satellite will remain in service through the end of 2019, and Intelsat says there will be no interruption in service. The satellite and the launch were insured, according to Intelsat. The company expects Intelsat 19 has enough fuel to maneuver the satellite for approximately 15 years, which was the craft's intended design lifetime. Testing of the satellite's communications payload will be completed by mid-July, Intelsat said.